IAC's Packing Table provides shippers with rugged and versatile platforms to efficiently handle the most demanding packing tasks. Start with IAC's rock-solid four-leg workbench, then select from a wide range of utility accessories to ease and speed the tasks in your shipping facility. Designed for seated or standing users, the telescoping legs provide worksurface height adjustment ranging between 30 to 36 inches in 2-inch increments. The impact- and chemical-resistant worksurface features a 180° rolled front edge for comfortable use. The Channel Upright Assembly attaches to the workbench and supports above-the-worksurface accessories, while additional options provide storage under the bench. These units are designed for placement adjacent to existing workbenches and conveyors, or wherever additional storage in the work area is needed. Packaging Accessory Stations are ideal for organizing packaging materials including rolled paper and wraps, tools, labels, books and manuals. PAS Series stations are free standing structures with two channeled uprights, on which a series of material handling accessories are attached with infinite vertical adjustment. 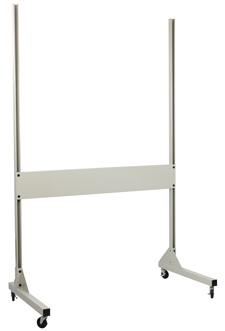 A caster leg option turns the stationary PAS into a mobile version that is easily re-located for continuous benefits. 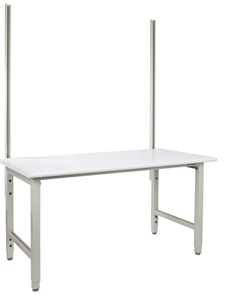 Standard Lengths : 60", 72"
Standard Depths: 30", 36", 72"
Standard Height (worksurface): 30" to 36"
Packaging Accessory Station: 250 lbs.